RunFun Travel is pleased to present this unrivalled marathon experience. The Schneider Electric Paris Marathon is one of the most prestigious marathons in the world, with over 40,000 runners each year. The course is essentially a sightseeing tour of the city; starting on the Champs Elysees and running down the wide Boulevard to Place de laConcorde, past the Louvre and out to the east of the city. It then joins the banks of the River Seine and returns past Notre Dame and the Eiffel Tower on the way to the finish at the Arc de Triomphe on Avenue Foch. If you'd like to sample the excitement, watch the video below from the 2018 event. Then contact us and reserve your place in this incomparable marathon in the most visited city in the world! Once you watch the video there's no way you'll want to miss out on coming to Paris with us in 2019! In terms of showcasing a city there is none better than the Paris Marathon - it takes in every major attraction in the city.... the Eiffel Tower, Notre Dame, Bois du Boulogne, Notre-Dame, Musee d'Orsay, the Bastille. And then there is the start line, where tens of thousands of runners assemble on the Av. Des Champs-Elysees with the Arc de Triumphe rising magnificently behind them. It is an extraordinary sight. Our accommodation choice is in close proximity of the start and finish area, being a few minutes walk to the start on the Champs Elysees and even closer to the finish, on Avenue Foch. Paris in the springtime is a perfect destination. Make it yours in 2019! Please note there is a cut-off time of 5hrs 40mins (from the last start). All runners must be at least 20 years old by 31 December the preceding year. All participants in sports events in France must supply a medical certificate with their race entry. This document will be forwarded to you as part of your entry process. Here at RunFun Travel we consider it's all about you! Therefore, we keep our groups on the small side, intimate, personal. Why? So we can make sure that we provide you with the best service available. Travel with us and see for yourself! Get together post marathon to share the celebration! Depart Paris.... or live the life and continue the journey in France/Europe! RunFun Travel has a range of extension options and suggestions if you’d like to enjoy the springtime in France. Let us help you with car hire, accommodation and tours. Or simply stay on in the city of love and enjoy everything Paris has to offer. Hyatt Regency Paris Étoile, stands as one of the most impressive properties in the city. This 4 star Hotel is located just minutes from both the Arc de Triomphe and the world-famous Champs Elysees. Offering so much more than a great location in this cosmopolitan city, this 34-storey hotel offers truly unique views over Paris, especially the Eiffel tower. As well as restaurants, luxury boutique shopping and exclusive bars, guests can also keep in shape and enjoy stunning views over the city at the fully equipped Fitness Centre on the 34th floor. The hotel is newly renovated (completed 2017) and rooms include a minibar, cable TV, air conditioning and a safe. Some rooms offer large windows with panoramic views of the city or of the Eiffel Tower. Deluxe bath products are provided and amenities include a work area with wireless internet access, 24-hour room service and deluxe bath products. 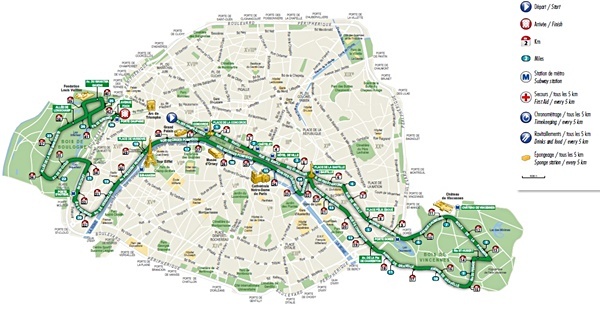 The hotel is located only a few minutes walk from both the start and finish areas of the Paris Marathon. What do we love about this hotel? Our fabulous 5d/4nt Paris Marathon Entry and Accommodation Package is just from $1,480 per person, twin share at the fabulous 4* Hyatt Regency Hotel Etoile.4d/3nt package also available from $1,210pp, twin share. Your Paris Marathon Entry and Accommodation package covers not just your accommodation but your guaranteed entry to the Paris Marathon and all associated products. A $400 non-refundable deposit is required to confirm your booking. All prices are in AUD and are subject to change at any time. France is the country of 'joi de vire' and now is your chance to experience the feeling! We have many options to share with you so please contact us for further information about your travel.